Chasten Buttigieg on husband Pete's presidential aspirations: "For real?" 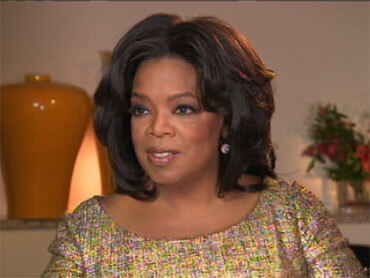 Oprah Winfrey says she'll reveal a deep family secret on her show Monday. And the chat rooms and blogs are buzzing over what it might be. Whatever it is, notes CBS News correspondent Michelle Miller, Winfrey promises it will be a real bombshell. All she's said so far is she "was given some news that literally shook me to my core. … I've been keeping a family secret for months, and you're gonna hear it straight from me." After years of reuniting loved ones, Winfrey is promising viewers the most anticipated one in her show's 25 year history -- and it's her own, saying, "This time I'm the one being reunited." And, Miller observes, while she's keeping the details a secret, it's sent her fans into a frenzy, with speculation online that Winfrey could be revealing the identity of a long lost family member, or even news about her father. "There has been speculation in the past," points out In Touch Weekly Senior Editor Amy Palmer, "that Vernon Winfrey is not her actual biological father, so this is something people are saying it could be." Through the years, Winfrey has shared some of her most intimate secrets, ranging from an abusive childhood to drug abuse. Now, with her show in its final season, the Queen of Talk has done a series of high-profile interviews, addressing, among other things, rumors of a lesbian relationship with best friend Gayle King. "She's the friend that everyone deserves," Winfrey told Barbara Walters. " … I'm not even kind of lesbian." With a life lived so openly in the public eye, Winfrey's always had a skill for capturing attention. Later Monday, Miller says, we'll see if she's still got it. © 2011 CBS. All rights reserved.